It’s not a monograph, it’s not a “best of” anthology, its not an annual. There are no images. Few specific examples. The spine is too stiff. The ink is not black enough. The pages are printed on a slick Kinko’s-like paper that certainly makes “grasping the idea” a challenge as your hands slide off every page like baby powder on a plastic table top. Although Dorst claims his primary audience are young designers fresh out of school in need of some practical advice entering the design profession, he also suggests these essays can challenge or reinforce design beliefs for more established professionals. 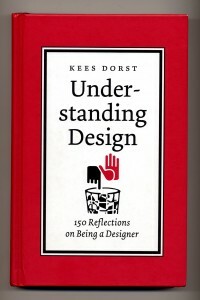 It should be noted that even though most of what Dorst writes aptly supports or challenges the experience of graphic design, his specific observations when citing graphic design are shaky. He is more successful when he focuses on examples drawn from his own experiences with product design or keeps it general. The drawback to the one page format is that some ideas can’t be discussed in depth enough to convince the reader of the validity of the author’s opinion. In addition, some of the essays appear fatigued or just slightly more articulate than a rushed journal entry. That does not, however, take away from the overall affect of being challenged to define and expand what Your Experience with design is, theoretically and practically. Dorst writes calmly and thoughtfully with a balanced voice between ideas and practice. Despite the slippery pages of the actual book, his words do take a hold and linger long after the one page reading experience passes. This book is a good “pick up anytime” volume to coach, challenge, and illuminate your profession.